It was only a few days ago when Google+ finally gave us access to brand pages – the moment we have been anticipating since summer. Now, anyone can create their own business page on Google Plus and it seems that within a few days a lot of businesses have decided to do so. The brand pages are still very limited though – for example it’s not possible for the brand page to have more than one admin at the moment. However, I still prefer Google+ over Twitter for following brands and keeping up with content from the thought leaders in social media and marketing. 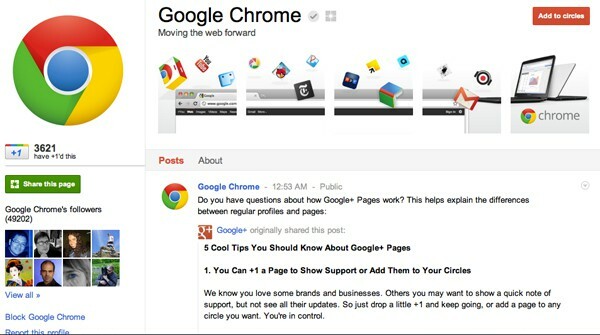 And surely Google+ will slowly roll out more features for brand pages. 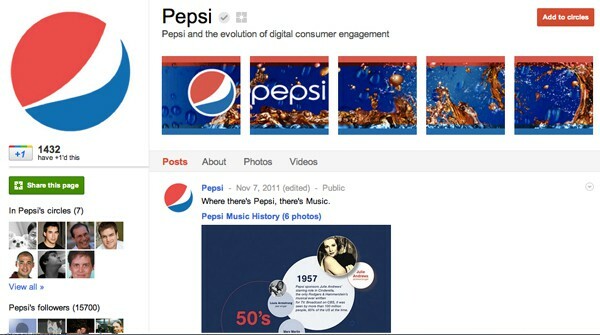 Here are some Google+ brand pages that I thought looked beautiful and here is our post [email protected] How to Create a Google+ Page for Your Brand. Adidas Originals five pictures make a cool sneaker. How about that? Google Chrome‘s Google Plus brand page is one of my favourites. Their designed pictures seem to be telling a story. 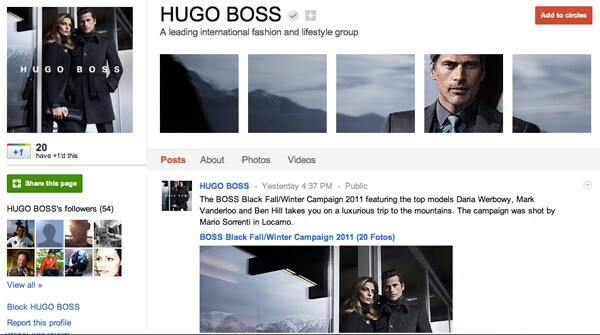 Hugo Boss went with a slick look and I think it suits them well. 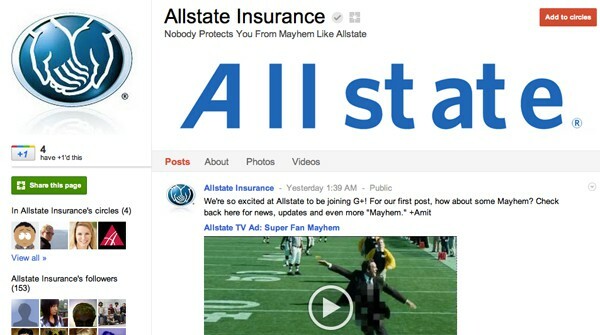 Allstate Insurance. Simple yet elegant. Pepsi seems to have hit the spot with the five pictures. They are already pretty active on Google+. I really like Mashable‘s simple and slick look. Finer Solution‘s pictures try to tell a story about what they’re providing. 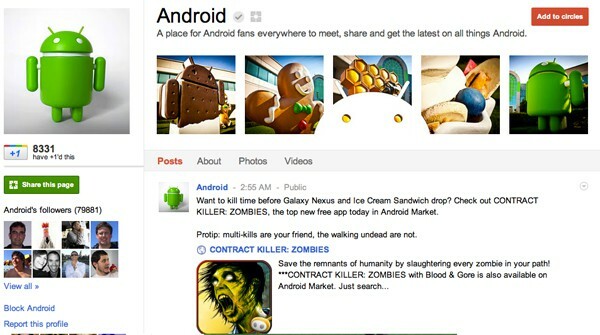 Android has themed their page about their latest OS ice-cream sandwich. Kudos for the design! 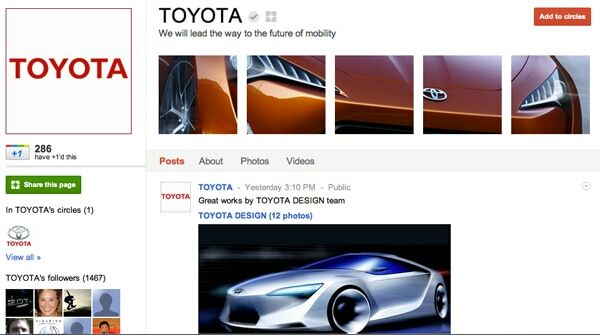 Toyota also has a slick look for their Google+ page where they are showing off their new car designs. Fox News shows off their lead anchors. Hoo doesn’t love owls? 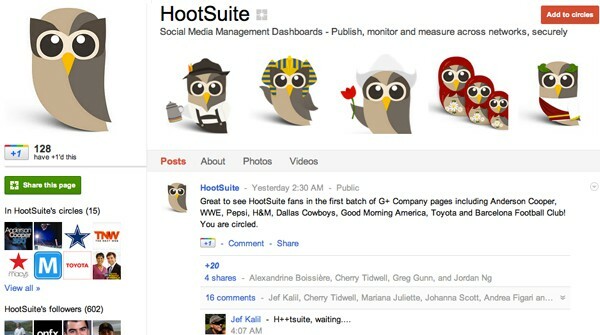 The social media monitoring tool Hootsuite has eight of them on their brand page. 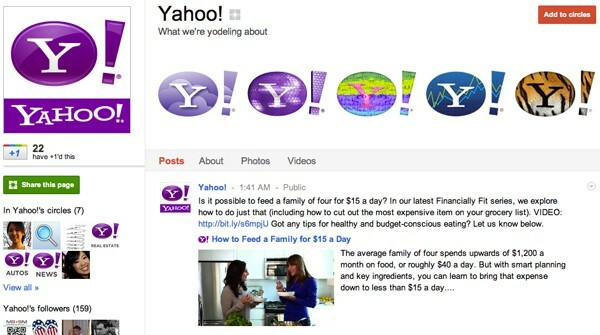 Even Yahoo is on Google+. 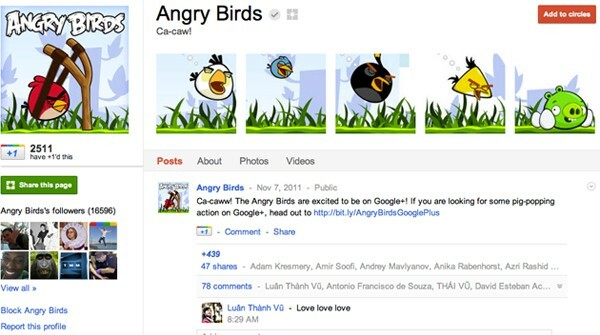 Angry Birds brand page is really cool and by now I think there are a few who haven’t heard of Angry Birds. 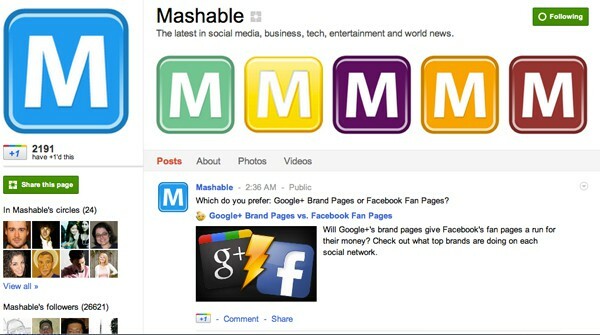 I found their example on Mashable’s post where they list a few awesome Google+ pages. If you still haven’t created a Google+ brand page, please read our guide about how to create a Google+ brand page for your business. These all look great, Thanks for sharing! wow this inspires me to design something for my page too. All your screenshots have the logo nicely placed in the left sidebar, on top, but our Google+ page has the logo placed to the right, in the header area, on top of the actual banner in the header. Valentin, you are right this post is from the time when Google+ looked different. We’ll update our post as soon as possible. Plenty of creative juice to get me going. Let’s go. WOW some pretty cool pages, nice work guys. https://plus.google.com/u/0/110438320782588868977/posts Frankly, I’m not sure what else to do with it. One of our graphic design/web developers had been working on animated caricatures of our staff, so those seemed like a natural fix for the photos section. I guess our issue is, we’re not a big brand and you have to wait for people to circle you, it seems like a lot of effort. Hopefully, like all things Google, it’ll get better with time. Great post and some really nice examples. Thanks, Josh! I appreciate it! Arby’s definitely looks very good. Kudos! I’m thinking about making a follow-up post early next month with more examples. It’s a shame that you cannot brand your page more than the 1+5 pictures at the moment but I guess you have to make due with what’s given. 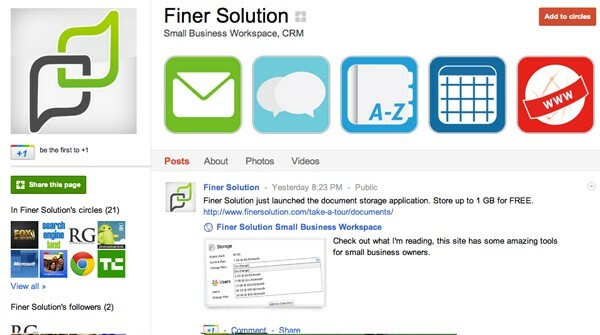 “Finer Solution” is a really strange name for a company. This examples are really cool. Now I have some good ideas on how to make my brand page. The Adidas one is really bad… They didn’t cut the image with the spacing… they just sliced 1 image up into 5 images and you can tell the stripes do not line up. Nice eye for detail, Evan. You are absolutely right about that. I didn’t even notice that up until now and there’s probably others like me out there. Thanks! I like this one, since I’m into fashion – love the mood! Clikbrix is making use of the Top Left Profile Pic and the fact that it flips around. One side instructions the other the ability to take action on the instructions. Clikbrix, has a great idea! I would like a bit more design, thou. This is the first experience. This is pretty cool, Fernando! 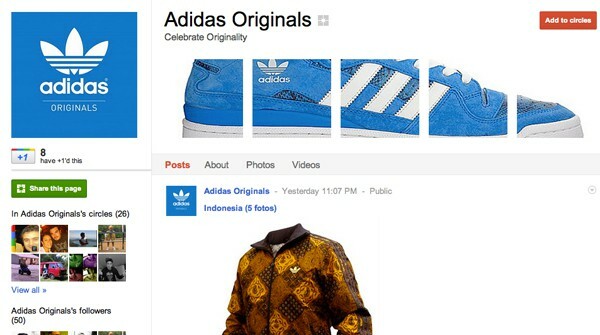 I particularly like the Angry Birds and Adidas pages. I also submit my band’s page for consideration and not just because I’m trying to promote my band. We’re hardly a big enough artist to warrant making this list. What do y’all think about the page? I like it, Jonathon. Thanks! But there’s only four small pictures used of the available 5. Why’s that? Thanks Mart. I just didn’t feel like we needed a fifth for that particular header. I tossed around a few versions of it with 5 pics, but felt it was overkill. Also, the absence of a “placeholder” photo space helps. 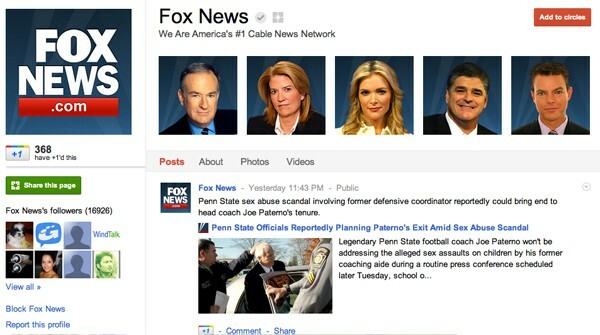 If G+ had the placeholders, like facebook, then a fifth pic would be necessary. Thanks for the list, by the way. I’m starting to think more about how we can leverage our brand page, and the examples you used have given me some ideas. Thanks Nick. We tried to get the top images moving with gifs but they didn’t. Will do some more testing. Red Bull’s G+ page. Moving, shiny, pretty. Thanks for your comment, Nick. Red Bull’s is definitely a great example! As Priit already mentioned, we tried adding animated gifs but it didn’t work. Wow, red bull’s is cool.